Valley Dogs is a 501(c)(3) non-profit (EIN: 26-0896950), no-kill animal rescue organization who's mission is to rescue dogs that have been abandoned, neglected, or otherwise placed in harm's way; to provide temporary housing for adoptable dogs, and to promote and encourage the responsible care of pets, especially spaying or neutering, micro-chipping and vaccination of dogs and puppies. Adoptions are held every Saturday at PetSmart at the Camelback Colonnade (South West corner of 20th St. & Camelback) Saturdays from 10am to 2pm (subject to change without notice). In April 2016 we graciously were honored by NBC CH12 for our community support. For more than 20 years, 12 News has supported volunteerism through the 12 Who Care volunteer recognition program. Each month a non-profit agency doing extraordinary work in our community is honored, encouraging others to volunteer to further their mission. Visit with some of our happy Alumni. 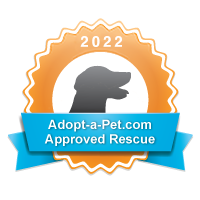 Thousands of pups have been adopted from VDR since 2006. Please enjoy their stories. Alumni Stories. Great doors and a % of the fee is donated!